​and enhance the well being of all life it sustains. 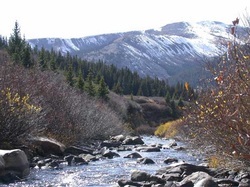 Arising in the snows of the continental divide near Leadville, Colorado, the main channel of the ancient Arkansas River flow some 1450 miles through four states to its confluence with the Mississippi River in eastern Arkansas. The total area drained by the river is over 160,000 square miles in parts of seven states. It is the fourth longest river in the United States. The Arkansas River Coalition is a 501 (c) (3) organization whose members can be individuals, families, organizations, towns and cities…. anyone or any entity with an interest in the Arkansas River and a willingness to accept and participate in our mission. Though headquartered in Wichita, Kansas, we welcome members from any part of the river basin/watershed and those outside the basin who have an interest in its protection and enjoyment. We have a Board of Directors currently consisting of eight members: Kay Drennen, Curt Demuth, Hoyt Hillman, Mark Hughes, Russ Icke, Tom Kneil, Nicole Olson, and Wally Seibel. One of the best ways of getting people to care for a river is for them to experience it and take ownership in it and a major way of experiencing a river is to get out on it. ARC organizes floats on the river and its tributaries during the spring, summer and fall months (and often a polar bear float in January.) The majority of these floats take place along sections of the river in Kansas and Oklahoma though floats elsewhere are possible. See the section on floats for a calendar, reports and our rules and regulations.